"OBSESSIVE-COMPULSIVE DISORDERS: A COMPLETE GUIDE TO GETTING WELL AND STAYING WELL"
Available at your local bookstore, or online at amazon.com or bn.com. This book contains extensive self-help information about OCD, BDD, Trich, Compulsive Skin Picking, and Compulsive Nail Biting. Trichotillomania may afflict as many as 6 to 8 million people in the United States alone. Dr. Fred Penzel has written the most up-to-date, comprehensive, and authoritative guide to this syndrome available, filled with reassuring advice for patients and their families. This superb handbook includes all the information a patient or relative would need to understand this illness and cope with it. Dr. Penzel provides a detailed disussion of the causes and he reviews all the treatment options, with particular emphasis upon cognitive and behavioral therapies, as well as the most effective medications and their side effects. He shows patients how to design a self-help program and gain control of their compulsive behaviors, how to prevent relapse, describes trichotillomania and its treatment in children, and suggest coping strategies for families at home and in public situations. There is extensive information on the biology of hair and hair growth. He also provides a guide to all the resources available, including internet sites, recommended books, and videos, and outlines ways to start a support group. The appendix includes questionnaires, clinical rating scales, and the official DSM diagnostic criteria for the disorder, so readers can decide if they need to seek behavioral and possibly medical treatment. Fred Penzel, Ph.D. is the Executive Director of Western Suffolk Psychological Services, in Huntington, New York. He is a licensed psychologist, and has been involved in the treatment of trichotillomania and related disorders for over twenty years. He sits on the Science Advisory Board of both the Trichotillomania Learning Center and the Obsessive-Compulsive Foundation and is a longtime contributor to the newsletters of both organizations. The author of the highly successful handbook Obsessive-Compulsive Disorders, Dr. Penzel lectures on trichotillomania and OC spectrum disorders, and conducts numerous workshops both nationally and internationally and has appeared on NBC's Dateline and ABC's 20/20 in segments about this disorder. Read what others have to say about "The Hair Pulling Problem"
"In my own recovery, I have found that education was a huge part of the process. That's where a book like this comes in. It is a thoughtful, in-depth look at a disorder that is little understood, often misdiagnosed, and incorrectly treated. Not only has Fred Penzel identified current treatment models and various hypotheses, he has included many valuable facts about hair in general, along with a break-down of behavioral steps one can practice. Living, as we do in a society that says if you look good, you are good, is particularly difficult for the person suffering from the body-focused behaviors that cause damage to one's appearance. The embarrassment of doing something oddly different than others is compounded by the toxic shame of believing that because of this, we are inherently bad, or weak. It is because of the need to address and confront these beliefs that I think it is wonderful to see a book of this caliber on trichotillomania in print." 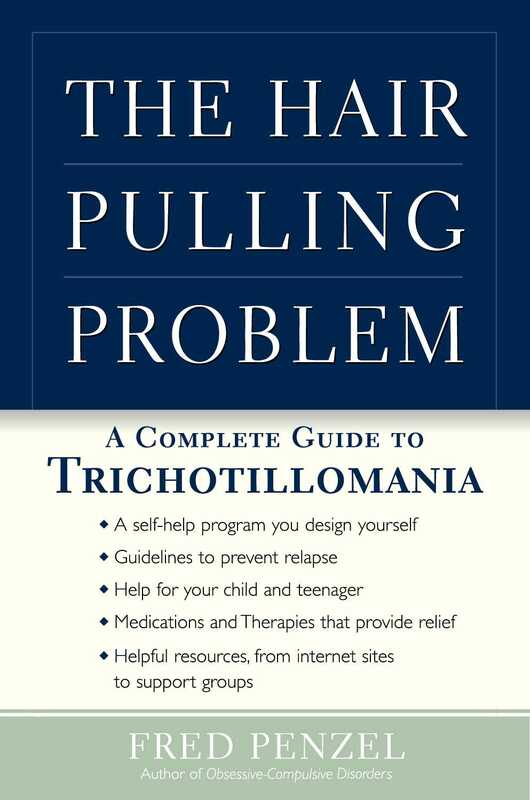 "The Hair Pulling Problem really deserves the description of self-help book. You can really use it to get control of hair pulling and your life." "Fred Penzel has written a wonderfully clear and helpful book aimed at patients with trichotillomania. The Hair Pulling Problem is a nice blend of the latest scientific data and treatments combined with Dr. Penzel's vast experience treating patients with this disorder. This book will be a very helpful guide for patients who suffer from this painful disorder. It will be encouraging for patients to learn how much is known about treatment and management. There are nice sections on how to design a self-help program. This is very important since competent help is not easily available in many parts of the world. This book discusses treatments that are likely to help trichotillomania as well as those that will not be of use. Unfortunately, many patients waste considerable time and money on treatment modalities that are not helpful. This book will assist patients in putting their energies and resources towards approaches that are likely to help." "Dr. Fred Penzel, a long time member of the Science Advisory Board of the Trichotillomania Learning Center, has spent many years treating people with hair pulling, teaching clinicians, writing about the problem, and advocating for sufferers. This considerable expertise shines through in this, his latest volume. It is the most comprehensive resource for people with hair pulling. It is clearly written, and contains dozens of practical ideas and tips that can help sufferers. Clinicians interested in Obsessive-Compulsive and related disorders will also learn a great deal." authors of "Help for Hairpullers"
"Dr. Fred Penzel's book is an accessible, comprehensive, sensitive, and scientifically accurate look at trichotillomania, a silent and potentially devastating disorder. Not only does the book do an excellent job of summarizing and explaining the current thinking about and approaches toward treating trichotillomania, but with his discussion on issues of acceptance and mindfulness, Dr. Penzel is in tune with the very latest research on the conceptualization and behavioral treatment of the disorder. I can see this book being of great interest to a large number of people. Those with trichotillomania (or family members of someone with the disorder) should read this book because it will allow them to better understand their (or their loved one's) problem, let them know they are not alone, and could aid in their recovery. Clinicians should read it because eventually someone with trichotillomania will walk through their door and this book will have them prepared. OCD-Spectrum disorder researchers should read this book because it contains useful summaries of current science and provides a wealth of potential hypotheses worthy of further exploration. And finally, the lay public should read this book if for no other reason than to understand the complexity and diversity of problems with which we, as humans, struggle and eventually overcome." the premiere organization for those who suffer from TTM. Become a member and start getting their excellent and informative newsletter.